10 am outside the Rose and Crown for gentle paced cycling. New riders always welcome. We cycle to a tea room for refreshments, and then back to the pub for further refreshment. Looks chilly tomorrow, so don’t forget your gloves! After last week’s rain, sleet and freezing temperatures, we look forward to much better conditions for our Sunday ride. In fact, Mr Sun looks to have his hat on and is threatening to come out to play. Dave “Don’t mention the hills” Howe has kindly sent in a new ride this week. He will be leading the main group which will be averaging around 13 mph and will remain as a group for the duration of the ride. Those wishing to cycle faster or slower are most welcome to ride with us too, but there may not be a nominated guide/fix-it bod for either of those groups. Tomorrow’s entertainment looks like this. Foggy or sunny? Best bring lights and bright clothing if its foggy. Another adventure with tea and cake starts at 10 am outside the Rose and Crown. New riders always welcome, pace set by the slowest rider. Mudguards- be kind to your bicycle and your fellow riders. Take a look at most cycling club guidelines, and you will find that not riding with mudguards is considered quite antisocial. Indeed, many clubs will not let you ride in winter without them. The mudguards below are fairly cheap and designed for road bikes. They can be fitted in about 30 minutes, and are easy to remove. There is a very good video on how to fit them too. No excuses. A misty morning, so lights and bright clothing would be good- meet at the Rose and Crown 10 am, back by 12 for further refreshment. All welcome. 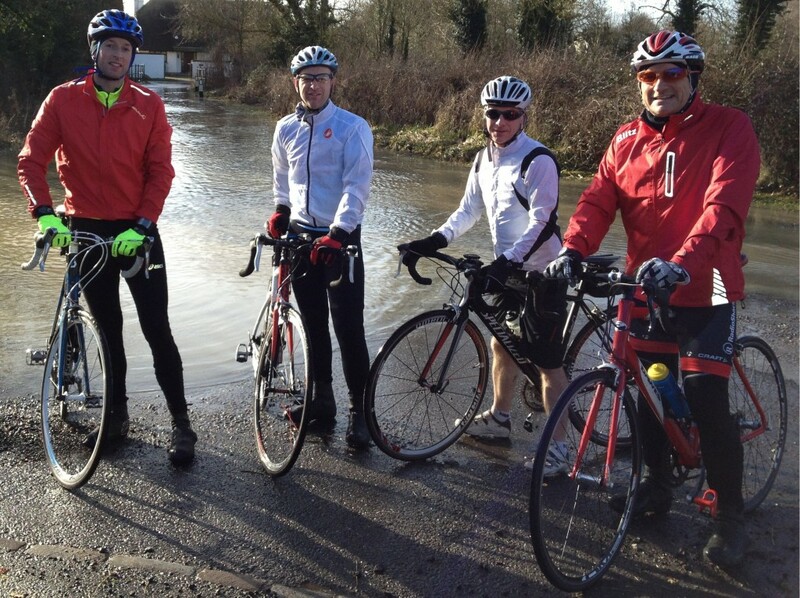 Jayne and Stuart are organising a cycle trip to Wallingford on the 2nd March. We have full details on the Wallingford trip page including a form that you can fill in if you want to get in contact with Jayne about joining them. We now have a page on the website listing any Sportives that people have expressed an interest in. Worth a look if you are thinking about entering one. Please do let us know if you have signed up then we can let others know that they won’t be alone in their quest for big miles ! Another new page is all about the Normandy trip planned for later this year. We will be updating this page soon with more details but, in the mean time, you can use the form on the page to register your interest. And so, on to tomorrow’s ride. Hopefully the standing water should have drained away a bit so we don’t have a repeat of last week where our route was blocked by a flood at Marsh !